Bight, North Island, New Zealand. 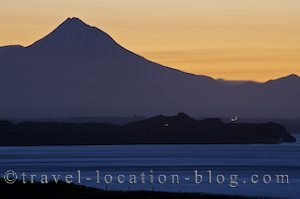 We began the new year 2007, waking up to a stunning view from our campsite at Cape Egmont with the Taranaki coastline on our doorstep in one direction and Mt Taranaki in the other. We plan to check out the third visitor information centre on the slopes of Mt Taranaki at a location called Dawson Falls. So leaving our awesome campsite, we back track a little to check out the wall murals along the main road in the town of Opunake. These wall murals are stunning reflections of the history of Opunake and Taranaki by mural artist Dennis Lattimer. Then we shot up the slopes of Mt Taranaki to visit the info centre then the actual Dawson Falls themselves. We walked the Kapuni Loop Track which takes about 1 to 1.5 hours to hike but allow extra time for photographing the vivid green flora along the way and Dawson Falls themselves. The 18 metre high falls are named after a Post Office Offical named Thomas Dawson who devoted much of his spare time to Egmont Exploration. Dawson discovered the falls in 1885. The Kapuni Loop Track was a wonderful nature walk surrounded by diverse flora in vivid shades of green. Highly recommended are a decent pair of hiking boats since the track becomes a series of steps which leads to the base of the falls - the steps can become a little muddy after some rain, though they are safe. After the heights of Mt Taranaki, we head back down to sea level and check out the Whitecliffs (named after the Whitecliffs of Dover in England - though not quite to the same scale). These cliffs dominate the North Taranaki Bight shoreline for around 7km. There are a number of view points of the cliffs of which we chose Pukearuhe Historic Reserve. As the day drew to an end we continued further up the coast and found a little gem of a park to camp the night (with the permission from the farmer). It was close to a cliff which provided stunning views of the coastline and the Whitecliffs, with a crystal clear view of Mt Taranaki in the background.